DON BASTIAN When it comes to tying classic streamers and wet flies, Don’s name is synonymous with excellence. With the popularity of classic streamers and wet flies on the rise, we feel grateful to have a fly tier of Don’s caliber instructing these classes for us. Don has been tying flies for 50 years, has been a fly tying instructor for the past 29 years and tied commercially for 12 years. He has guided fly fishermen in Pennsylvania for 16 years and he has authored three fly tying DVD’s: Advanced Classic Wet Flies, Traditional Streamers and Bucktails, and Tying Classic Wet Flies. Don was the featured author of Ray Bergman biography in the book Forgotten Flies and has a combined total of approximately 765 flies published in that volume. His flies were regularly published in Art Of Angling Journal 2001 – 2003 and he has been published in Fly Tyer, Fly Fisherman, Mid-Atlantic Fly Fishing Guide, Hatches Magazine, Fly Tyers of the World, Vol. IV, (yet to be published), and Fly Fusion. Don will be instructing two full-day classes. Many of the techniques and methods taught in this class will be of benefit to you regardless what type of flies you tie. Classic Wet Flies This class will focus mostly on the old Maine Lake Fly patterns dating back to the 1800’s. We will tie at least one each; a snelled pattern and one with a gut snood, both on blind eye hooks. Classic Streamer Flies This class will focus mostly on Maine patterns which will include some of Carrie Stevens unique Rangeley Style methods of construction. Classes are limited to 13 students ~ Payment in full is required to hold a space in these classes ~ All tying materials (except thread) will be supplied ~ Students need only to bring their vises, tools & thread. 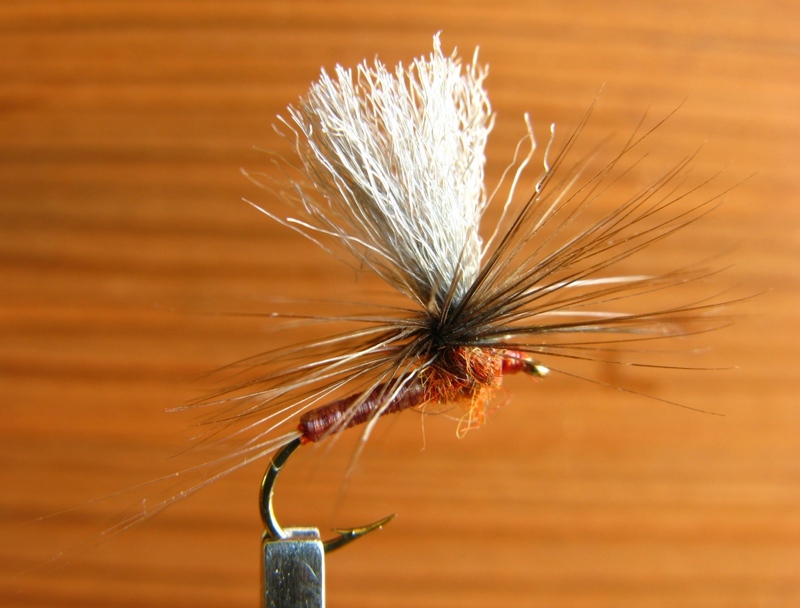 The Saturday class topic is classic wet flies and will feature the heritage patterns of 19th century Maine Lake Flies, such as the Belgrade, Rangeley, Richardson, Cupsuptic, Parmacheene Belle, etc. The class will include tying patterns on eyed hooks, which became popular in the mid-1890’s, as well as dressing a fly or two on a classic blind-eye hook using both a gut snood and a snell. Sunday’s class will focus on classic Maine feather-wing streamers and will include traditional Eastern styles of tying, with a special feature of two Carrie Stevens streamer patterns, presenting her unique Rangeley method of streamer construction, combined with my personal adaptations (for starters, unlike Carrie Stevens, I use a vise). Full details of her methods using information from classic streamer guru, Mike Martinek, Jr., and Austin Hogan’s notes on his deconstruction of Carrie’s flies will be included. Fly tying classes have been around for some time, but not for a long time. If you have more than a couple decades or half-a-lifetime or most of your life, of fly tying experience, then perhaps you’ve heard stories how fly tying used to be, back in the old days, somewhat of a closely guarded profession, secrets were kept, even though there were a few books written on the subject. Back in the early 1930’s Walt and Winnie Dette, famous Catskill fly tying husband and wife team, asked Ruben Cross, author of Tying American Trout Lures, 1936, to teach them how to tie flies. They offered Rube the tidy sum of $50 in return for lessons, which at that time, considering it was the Great Depression, was more than pocket change. Their request was met with Rube’s terse reply, “Go to hell.” Undaunted, the Dette’s bought some of Rube’s flies, carefully took them apart, made notes, and taught themselves how to tie flies. The rest of that chapter is history. Back in 1964 when I started tying flies, my dad showed my brother and I how to get started; a short lesson consisting of dad tying three flies, then giving all his tying tools and materials to Larry and I. We progressed for several years tying and trying, using the instructions in Ray Bergman’s Trout and the brief chapter titled, On Tying Flies, and How to Tie Flies, by E. C. Gregg, 1940. Fly tying lessons were slow to catch on in the late 1960’s and through the ’70’s. Nowadays, many fly shops have in-house demos and lessons and there is a plethora of fly tying videos on the market. And then there is the internet; forums, online how-to articles, and you tube videos of tying hundreds of fly patterns. There are many fly tying “arm-chair experts” out there, some qualified, some, well… Considering the wealth of available fly tying information, still, the best learning source is to take a class with an experienced, professional, accomplished fly tier who knows their work and also has an ability to teach and has appropriate organizational and instructional skills to lead a class. DVD’s are great, but when I started teaching fly tying lessons twenty-eight years ago, I learned that even “professional” fly tying instructors are not always the best teachers. How did I learn this? I learned it over time from my students, and also from people that stopped by my tables at fly tying shows, where I have presented and demonstrated for over twenty years. Repeated questions on a number of tying topics convinced me that many fly tying instructors take too much for granted in their students, they assume knowledge and / or a level experience that may not be what they believe. My definition of a professional fly tier is one who has several notches in their gun belt. More on those “notches” in a few moments. Whether one should take a fly tying class or not is a question that perhaps you have pondered. I started tying in 1964, and never actually took a fly tying class until I was working for Cathy and Barry Beck. Barry suggested I sit in on a class being taught by the late, great Jack Gartside.The next step for me was to serve as assistant instructor in a class taught by Barry Beck. Prior to these early 1990’s class sessions with the Beck’s, in 1985 I organized a new format for a beginner’s fly tying class for my local Trout Unlimited Chapter in Lycoming County, Pennsylvania. I found out the chapter formerly conducted fly tying classes, but they had not been held after I joined in 1974. I served as class coordinator for these classes, and several chapter members who were also experienced fly tiers participated as teachers and assistants. Extra help can be a good thing and is generally beneficial, but oftentimes, there are some personal preferences and variations in individual fly tying habits that can be passed to the students by well-meaning assistants. Favorite methods of one person are not necessarily those of another. This can also be a good thing, I’m all for presenting multiple methods of skinning the cat, but there is also the possibility that the assistants can inadvertently contradict what the head instructor is teaching, and in the end, this can be confusing to the students. Good organization is key. 1) Fly Tying Experience – the more the better. A qualified instructor has more than a few years, I’m talking decades of fly tying experience. If taking advanced classes, one ought not be able to count the potential tying instructor’s years of experience on the fingers of one hand. Intermediate tiers can teach others the basics of beginning and intermediate fly tying. Regardless of that, the best fly tying instructors have twenty, thirty, forty or more years of experience in fly tying no matter what the subject matter. 2) Fly Tying Teaching Experience – like number one, the more the better. A good instructor for teaching advanced fly tying patterns and methods should be one who has taught classes for at least ten years. That said, there are a few fly tiers who have excelled in a particular style of tying in a relatively short period of time. Pat Cohen of New York, a deer hair master with only about five years of tying experience, comes to mind. A good instructor can plan the class itinerary, stick to it, proceed at a comfortable pace, and get the lessons across without leaving any student lingering for lack of understanding the material and methods being presented. The instructor should also be skilled enough to plan for contingency variations, often tailoring specific tying procedures to the students needs or requests. 3) Teaching Ability – differs from teaching experience. Tenure does not necessarily translate to good instruction. A good fly tying instructor knows threads, deniers, and applications, and also should know, for example, the reason and explanation why left-handed fly tiers often have trouble with fraying threads. A good class instructor will be able to have his students learn in a relaxed atmosphere, and be able to answer their questions and help them trouble-shoot any problems they may be having. A good instructor can present each pattern and material usage and tying method and application in a manner that is easily understood by all the students, without skimming over or skipping significant details. This is more common that you might think; much of my personal teaching methods and instruction style is very detail-oriented; the result of fielding questions from fly tiers who have taken other classes and came away, shall we say, less than completely satisfied. 4) Versatility – a good fly tying instructor for advanced classes is one who has pretty much achieved a personal level of mastery of a particular group or groups of fly patterns and tying styles. Catskill Drys for example. If one ties and fishes only drys, then there’s not much point learning how to tie saltwater flies. But the more accomplished a fly tying instructor is, the better teacher they can be. Even though as an instructor I admit willingly to still being on the learning curve, as we all are. 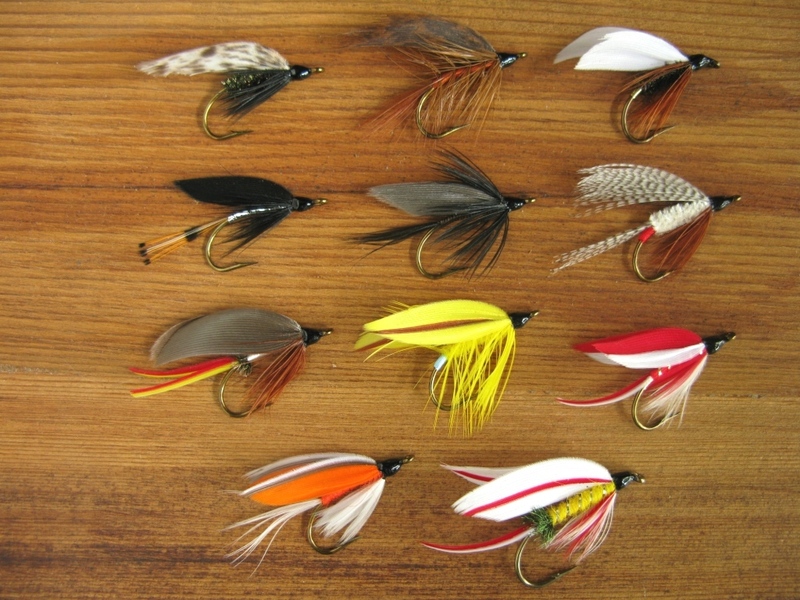 A good fly tying instructor knows wet flies, streamers, bucktails, dry flies, saltwater flies, and possibly hairwing salmon flies; these are basically bucktails and wet flies combined; a smidgin of bass bug information and maybe a little deer-hair spinning, and one or more sub-categories within each group. Full-dress salmon flies are a nice notch to have in one’s gun belt, but are not essential to being a good qualified fly tying instructor. 5) Knowledge and Ability – a good fly tying instructor knows how and why things work the way they do, and knows how to explain and teach methods that enable students to learn “how and why,” so the students can progress, learn, and make things work as they should. 6) References – last but not least, a good fly tying instructor will provide references of their past teaching experiences from a number of sources; venues, shops, and locations. References from former students and fly tying clubs should also be readily available. And it goes without saying, these should be good references. Watch this blog for upcoming class schedules. I’ll be at a location in Massachusetts in February, and Maine in March. Possibly a few more locations. Details to be announced! As part of a custom dry fly order I’m working on, this is a second pattern installment, one of my versions of the Hendrickson – Red Quill, or Male Hendrickson Parachute Dry pattern. This dressing once again uses the stretchy body synthetic material, known on the fly tying material market by multiple names: Sexi-Floss, Dyna-Floss, Floss-Flex (formerly by Orvis as Super Floss – they discontinued it), etc. 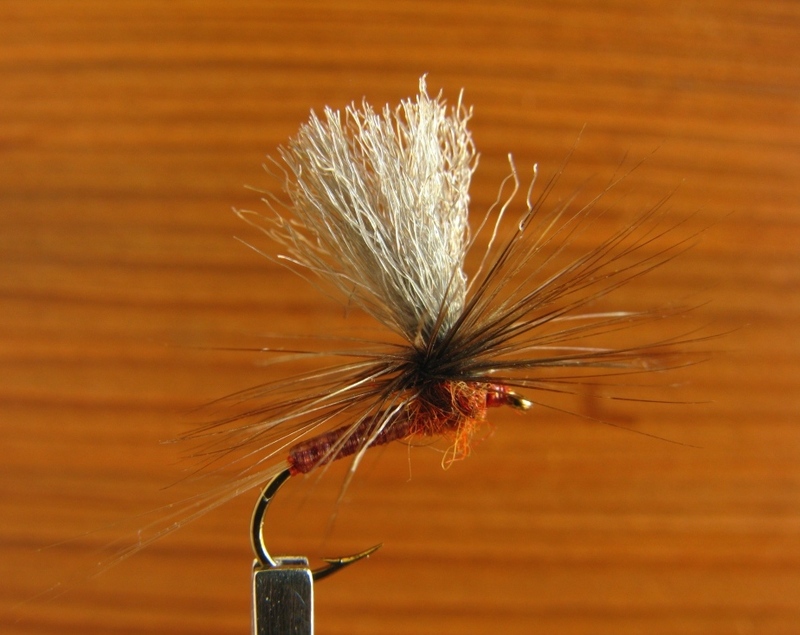 #14 Red Quill Parachute Dry – tied and photographed by Don Bastian. This photo and the one following are taken at different shutter speeds, and therefore they present different lighting and depth-of-field. I have presented both these macro photos with different lighting, since the exposure may not accurately reflect the actual color of the fly. I suggest you combine what you see with what I write; generally there is truth (from me at least) in both the photo and written word. At least I endeavor to make it so. #14 Hendrickson – Red Quill Parachute, tied with Sexi-Floss, etc. abdomen. 1) Start tying thread at hook eye, position wing material about 1/3 distance from eye to hook point. 2) Post the base of the wing with thread about 3/32″ to 1/8″. 3) Attach clipped hackle stem upright to base of wing post. 4) Wind to hook point, clip tag thread end, attach six Microfibetts tail fibers. Wind to end of body. The tail fibers are divided using a left-hand thumb and finger pinch, ending with thumb-only pressure against hook bend. This makes the fibers flare out. Take the three fibers on the near side, using your left index finger tip to angle them toward you, and then divide the fibers with four figure-eight wraps using maximum tension thread wraps. YOU MUST do this with maximum thread tension, and you must also move your grasp w/left hand from right to left side of tail, back and forth, on the fibers as you progress, to stabilize and counteract the thread torque as the wraps are made. Up to speed, this takes me six to eight seconds to tie a split tail. But then again, since I started using this technique over twenty years ago, I bet I have tied more than 10,000 to 12,000 dry flies with this method and material. Experience and repetition is what really makes you good at what you do. 5) Advance thread to thorax, attach Sexi-Floss. Holding it secure with max thread tension, stretch it, and then wind back over the material, then back to thorax again. Be careful not to compress the tail fibers with the tying thread or the Sexi-Floss. 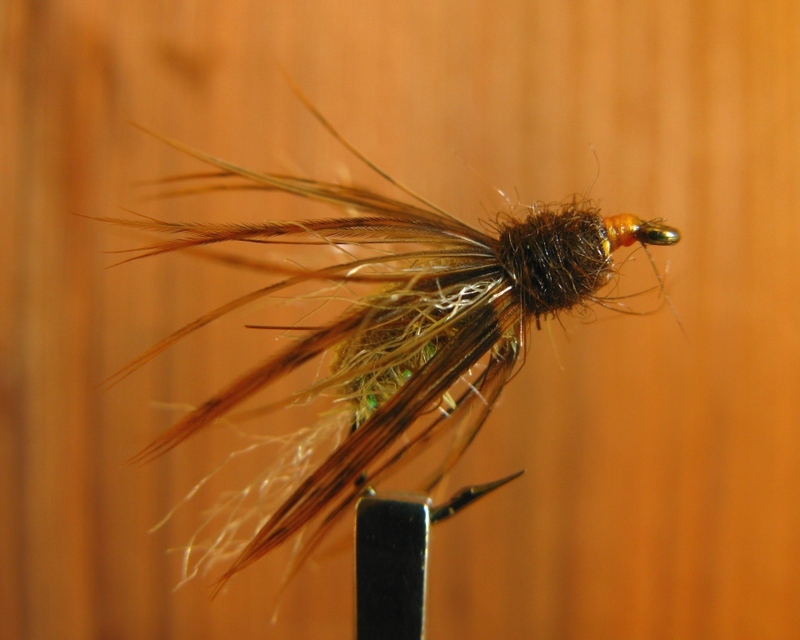 The thread forms the underbody, and with the #47 Tobacco Brown thread and translucence of the Sexi-Floss, creates the lovely and realistic reddish-brown appearance as on the natural Ephemerella subvaria mayfly dun. 6) Wind the Sexi-Floss to form the abdomen. Secure with 3 -4 tight wraps, trim excess. 7) Apply dubbing and create thorax. 8) Wind the hackle counter-clockwise, five to six turns, tie off. For additional instructions of the tying procedure, see my recent Parachute Adams post. 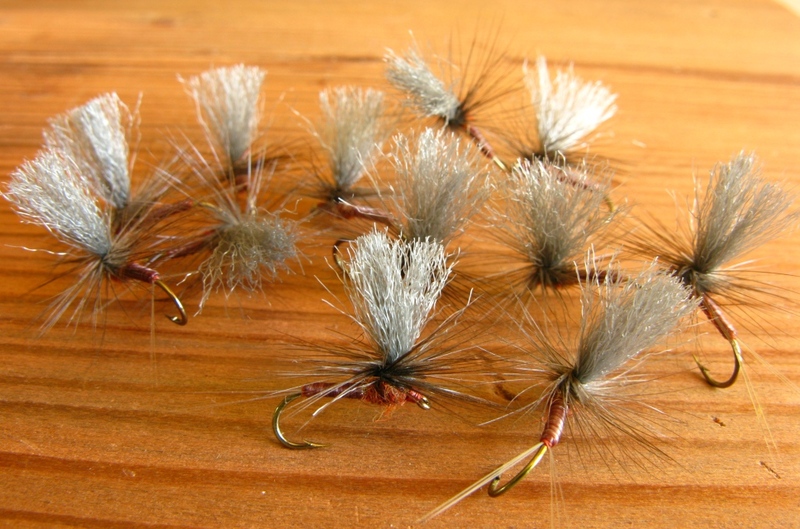 A dozen #14 Hendrickson Parachute Duns, ready to fish! Tied and photographed by Don Bastian. Between the split tails and the parachute hackle, this is a land-right-side-up-every-time fly pattern. Good tying style for any may fly pattern. I will be happy at anytime when I am demo tying on locations to demonstrate and teach you this split-tail technique. I learned it from Barry Beck, back in my commercial tying days. This trick alone increased my Comparadun tying production from 9 to 10 flies an hour to 17 or 18. It’s true, I was once timed at a demonstration in Ontario – a #14 Light Cahill Comparadun, three minutes flat. Including head cement and fly out of the vise. Also, following up on the successful bidding of my private fly tying lesson donation this past December to the American Museum of Fly Fishing in Manchester,Vermont, I have recently started teaching private fly tying lessons right here in my rural Cogan Station, Pennsylvania, home. It is peaceful and quiet, St. Michael’s Road is lightly traveled; deer, turkeys, and other wildlife sightings, even the occasional black bear, are common. The view to the north of Bobst Mountain is gorgeous, and I’m far enough away from Williamsport that the light pollution is minimal – you can actually see the Milky Way in a clear night sky. On warm summer night, if you leave your bedroom windows open, you may even hear the howl of coyotes. If you come, you are my guest and are treated accordingly. All fly tying materials are provided, you only need to bring your vise, threaded bobbins, a light, and tools. Depending on time of year, your visit can also include a little hosted fishing if desired. The standard package is a morning arrival, stay all day, comfortable and quiet overnight accommodations, with a full breakfast the next morning. I do all the cooking and care for your comfort during your stay. We can tie what ever you wish – drys, classic wet flies, saltwater patterns such as Lefty’s Deceiver, Half and Half, Clouser Minnows; hairwing salmon and steelhead patterns, nymphs, emergers, soft-hackles, 18th century Orvis and other classic and historic patterns, or bucktails and Rangeley and eastern style streamers. I specialize in classic wet flies, Carrie Stevens (teaching her original methods of material placement and usage), and other tiers of classic streamer patterns, 18th Century Lake Flies, and traditional patterns. 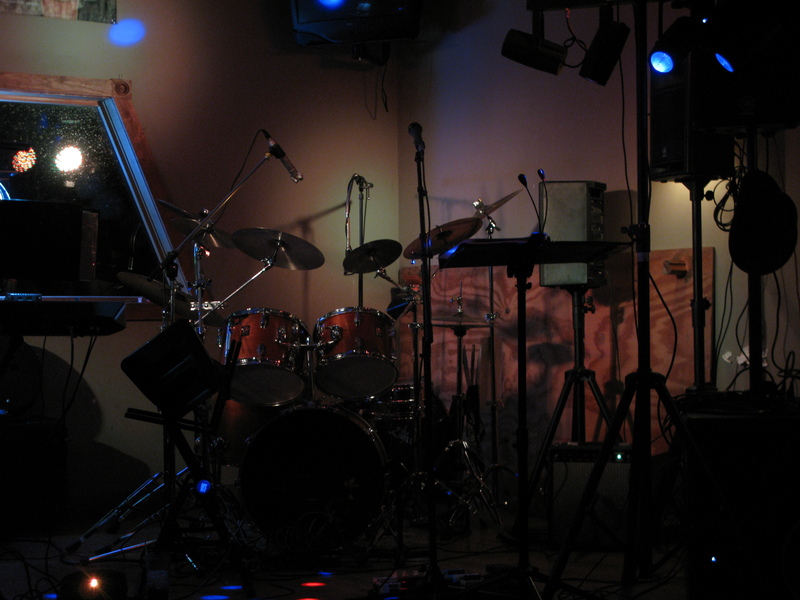 Small groups of two or three persons can be accommodated.